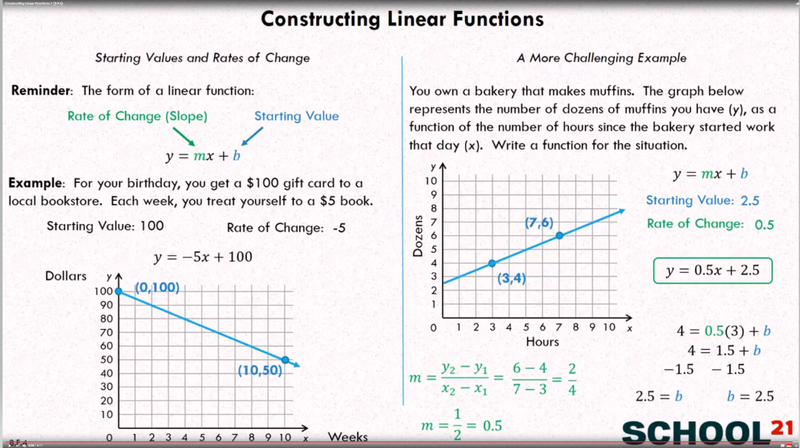 Examples, solutions, videos, and lessons to help Grade 8 students learn how to construct a function to model a linear relationship between two quantities. Determine the rate of change and initial value of the function from a description of a relationship or from two (x, y) values, including reading these from a table or from a graph. Interpret the rate of change and initial value of a linear function in terms of the situation it models, and in terms of its graph or a table of values. I can determine the rate of change (slope) from two (x,y) values, a verbal description, values in a table, or graph. I can determine the initial value (y-intercept) from two (x,y) values, a verbal description, values in a table, or graph. I can construct a function to model a linear relationship between two quantities. I can relate the rate of change and initial value to real world quantities in a linear function in terms of the situation modeled and in terms of its graph or a table of values. The following table shows how to construct linear functions from its graph or a table of values. Scroll down the page for more examples and solutions. 1. For your biRthday, you get $100 gift card to a local bookstore. Each week, you treat yourself to a $5 book. Write a function for the situation. 2. You own a bakery that makes muffins. The graph below represents the number of dozens of muffins you have (y), as a function of the number of hours since the bakery started work that day (x). Write a function for the situation. The football booster club ordered 7,500 L of water for Friday night's game. The water sale averaged 150 L per minute. Solve the problem algebraically, numerically, and graphically to determine the amount of water remaining after 45 minutes? Analyze patterns and represent functions.